An adapted version of this recipe appears in my book The Wheat-Free Meat-Free Cookbook: 100 Gluten-Free Vegetarian Recipes. 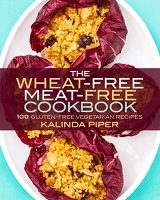 Check out the book on Amazon if you’re looking for more tasty recipes. Pears were on sale last week. We had a ton. When I heard that this month’s Go Ahead Honey, It’s Gluten-Free was themed Spiced Desserts the wheels started spinning. And once I mentioned the idea to Mike, there was no way I was not making poached pears. Place wine, water, cinnamon, cloves, and sugar in a medium-sized saucepan. Bring to a boil. 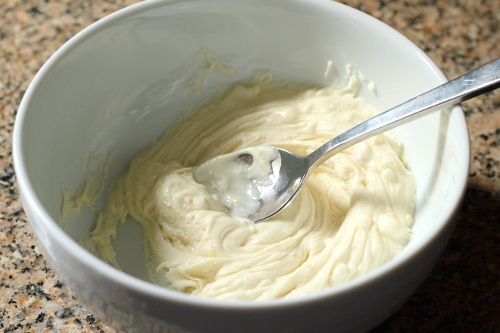 Meanwhile, fill a large bowl with cold water and a couple tablespoons of lemon juice. Core the pears from the bottom. 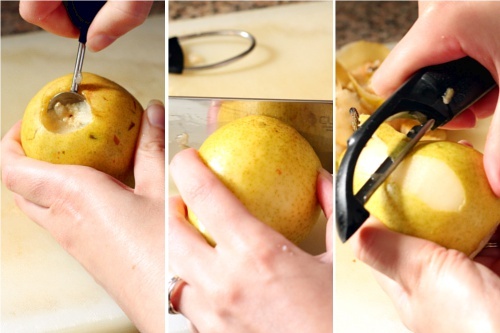 Slice a little off the end so that the pear can stand up, then peel. Place each pear in the water after peeling to keep from browning. 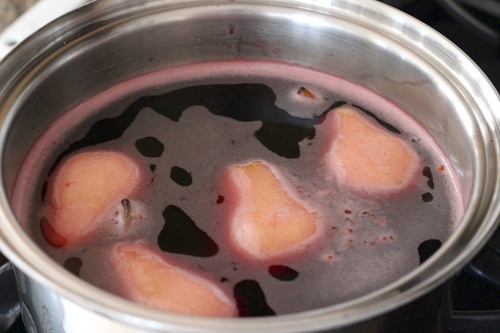 Once the wine mixture is boiling, reduce the heat, and add the pears. Simmer the pears until soft (15-45 minutes), making sure to turn them periodically if they’re not entirely covered by the wine mixture. Remove the pears from the pot, and set aside to cool. Return the pot to high heat. Let the wine mixture boil until it’s reduced by half. Remove from heat and set aside to cool. While the syrup is reducing, melt the chocolate chips in the microwave or double boiler. When pears are cool enough to handle, spoon or pipe the white chocolate into the pears. Once the syrup is room temperature, place one pear in the middle of a small plate. Spoon syrup over the top. Garnish with berries and serve. With regards to the cooking time, the pears will probably be sufficiently soft in around 15-20 minutes. However, the longer they soak, the more they color. I let them simmer about 45 minutes. You could go even longer. If you want them really dark, you can actually refrigerate them overnight in the wine, then boil it down the next day. While the syrup was thicker than the wine itself, it was not the consistency you probably think of when you hear the word syrup. If you want a thicker consistency add more sugar. Any leftover syrup can be kept in the refrigerator for a few days. Maybe to be used as a topping for ice cream or other fruit? I used my 1/4 teaspoon to dig out the core. Many people suggest a melon baller. Or a corer. That’s probably easiest. But you need to own one. I’m also lacking a pastry bag. But I do own a spoon and fingers. While piping the chocolate into the pears using a pastry bag might be a bit neater and easier, a spoon got the job done. This recipe is also appearing in This Chick Cooks, Full Plate Thursday, Hearth and Soul Hop, and Slightly Indulgent Tuesday. These are beautiful. 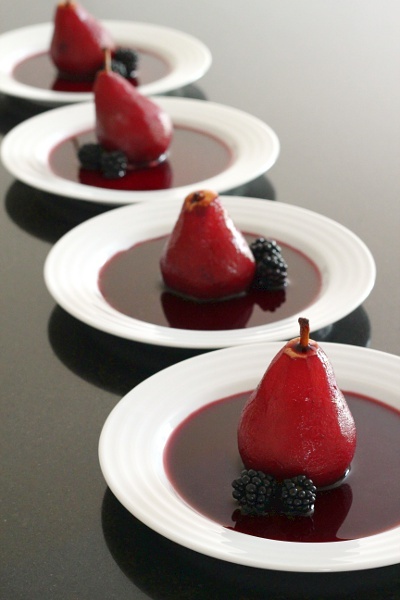 We did poached pears in red wine over the weekend but they didn’t turn out nearly as lovely. What a nice idea to stuff them as well. Thanks ladies! I kind of surprised myself with this one. 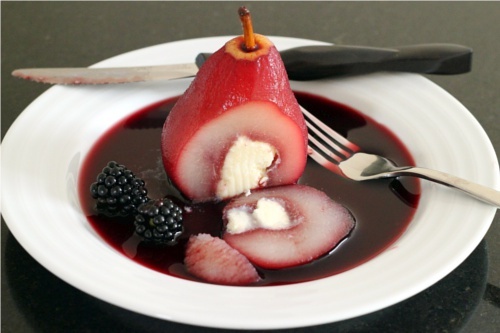 Your Stuffed Poached Pears are such an elegant dessert. They are just beautiful! Thank you so much for sharing with Full Plate Thursday. Hope you are having a great week end and come back soon! 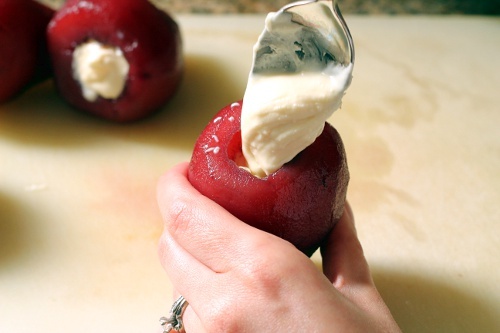 Your stuffed poached pears are absolutely gorgeous! And they look delicious too. Thank you for sharing your recipe with the Hearth and Soul Hop. These are absolutely gorgeous. Wow. 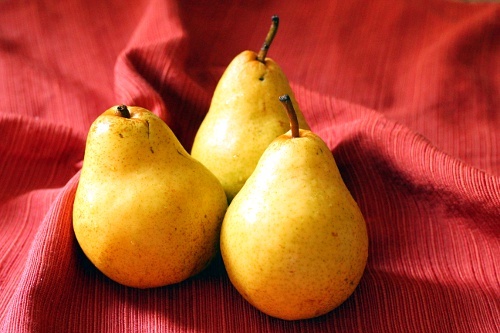 I have yet to poach pears…not sure why! If nothing else, they’re so pretty. I tried these over the weekend and they turned out tasty and absolutely beautiful! This was the perfect thing to impress the in-laws. @MizHele: Woohoo! It’s always a pleasure. @Batgirl: Awesome! There’s something extra special about passing the “impress the in-laws” test. These are beautiful. Your photos make it look so easy. What a beautiful holiday dessert.